2015 was busy with significant and productive projects for animal rights but I didn’t achieve all four of the goals I had set myself listed here when I reviewed 2014. Before I confront what I thought I was going to do in 2015 but didn’t and why not, I want to recognise that 2016 is my fortieth anniversary of personal commitment and professional advocacy for a vegan, animal rights world. In January 1976 I became a vegan and later in October I became the Campaigns Officer at Compassion In World Farming when unbeknown to me my career began in animal rights with some of the world’s foremost organisations. But for now I want to reflect upon last year when I thought I would complete the first draft of the manuscript for my second book. 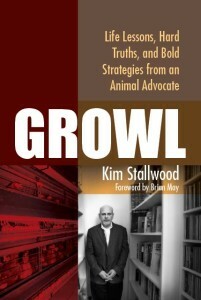 This book, The Animal Rights Challenge, begins where my first, Growl, ends. Material for what I call Book 2 is already available to read here and the subpages in this section. I want to examine the animal rights movement, assess society’s response, and propose a strategy framing moral and legal rights for animals as part of a progressive agenda for social change. I did work on Book 2 in 2015 but the first draft is still unfinished. The manuscript is well developed in places but insufficiently developed in others. My challenge is to find the time in my current schedule to read, think and write without interruption—a persistent struggle! I thought last year I would travel to Australia to speak at a conference and promote Growl. I planned a stop-over in Hong Kong to meet with John Edmundson to talk about the Humanitarian League Library he’s building. I also thought I would have my second speaking tour promoting Growl in America but this time on the west coast. Sadly, I cancelled both trips because I was busy with other projects and wanted to push on with Book 2. One of my highlights from MAC3 was chairing the Young Scholars Panel. They spoke about their aspirations for animal studies scholarship. Book-ended between Rod Bennison and myself from left to right, they are Upasana Ganguly, Jessica Ison, Kelsi Nagy, Yuan-Chih Lung, and Adam See. The one thing that I said I would do and did was go to India in January. This trip was made as the volunteer Executive Director of Minding Animals International. 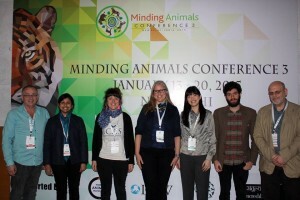 I attended MAI’s Third International Minding Animals Conference (MAC3) in New Delhi and wrote about the experience here. The conference was very successful attracting more than 320 delegates from 35 countries. It was a collaboration between MAI and the host Wildlife Trust of India and held at the Jawaharlal Nehru University in New Delhi. 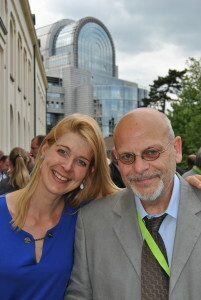 These triennial international conferences bringing together animal advocates and animal studies scholars shows how collaborations can produce successful events which bring benefits to animals far greater than each of us could have achieved on our own. Toward the end of 2015, we announced MAC4 will be in Mexico in July, 2018. We look forward to partnering with our co-hosts the Universidad Michoacana de San Nicolás de Hidalgo, located in Morelia, and the Universidad Nacional Autonomy de México (UNAM) located in the southern suburbs of Mexico City. Rod Bennison, MAI’s founder, and myself look forward to MAC4! This was my first trip to India and I resolved it would not be my last. India is a fascinating country. Her relationship with animals is simultaneously disturbing and inspiring. I very much hope to make a return trip in 2016. By the way, I presented my paper, ‘Topsy, An Elephant We Must Never Forget,’ at MAC3. Topsy is the focus of another book I’m working on. I describe myself as an animal rights consultant and independent scholar. I’m pleased to say my consultancy with animal protection organisations continued in 2015. Look at all these lovely vegan goodies at the Brighton Vegfest! For example, my work with Compassion In World Farming and its Chief Executive Philip Lymbery, which began in 2009, continues as editor of his website. As I said earlier, Compassion was the first animal welfare organisation I worked for in 1976. I appreciate its role in working across the spectrum—from farmers to consumers, opinion formers to policy makers—in making a difference to how animals are raised for food at the level of the individual and society. I also support Compassion’s mission framing industrial agriculture, particularly factory farming, as a leading cause to the inequities in food production and the threat that climate change is to the world. 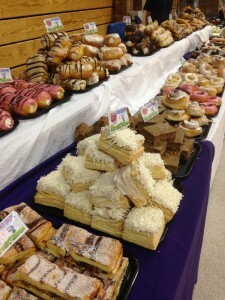 Vegfest, the dynamic company organising increasing numbers of vegan events throughout the U.K., engaged me to organise ‘Vegan Visions,’ a series of workshops and presentations, at their London and Glasgow events. I curated a program of speakers that included academics Erica Fudge and Kay Peggs and advocates Louise Wallis and Melanie Joy. At the Brighton Vegfest, I made a presentation on animal rights and gave the opening remarks to a special conference that focussed on May’s general election. 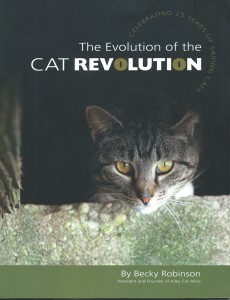 The Evolution of the Cat Revolution by Becky Robinson, President and Founder of Alley Cat Allies. Shortly after the general election I published a blog here, What Next for Animal Welfare in the UK?, which was critical of the British animal movement and its lack of progress in making animal protection a mainstream political issue. A new client in 2015 was Alley Cat Allies, the U.S.-based organisation whose concern is cats in the community. I produced a book, The Evolution of the Cat Revolution, written by Becky Robinson, the organisation’s president and founder, that celebrated their 25th anniversary. It includes 25 achievements, a timeline, and other features showcasing their work for cats, including trap, neuter and return (TNR). This project led to a second assignment that I’m currently engaged with. I’m spending a significant amount of time in Alley Cat Allies’s office in Bethesda, MD, where I’m producing a strategic plan and advising on their programs. I wrote about the time I accompanied Becky to a talk she gave and when we helped out at a temporary clinic that spayed and neutered 200 kittens cats. I made a number of presentations at conferences throughout 2015. For example, it was a great honour to speak at an international conference at the University of Northants celebrating the life and work of Brigid Brophy. 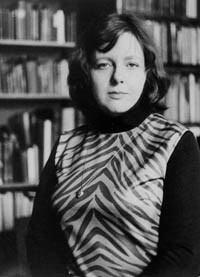 The conference recognised the 50th anniversary of the publication of Brigid’s essay, “The Rights of Animals,” in The Sunday Times. In my talk I spoke about working with her on an organisation called the Council for the Prevention of Cruelty by Angling in 1981. I was CPCA’s vice president and she was the guest speaker as our vice president at our inaugural meeting. I recalled her presentation and the way in which she used her biting wit and sharp analysis to condemn catching and killing fish for fun. I was also honoured to speak at a conference celebrating the fortieth anniversary of the publication of Peter Singer’s Animal Liberation at the University of Rennes in France. I presented a specially adapted version of my talk, Animal Liberation: Moral Crusade or Political Movement, in which I spoke about my association with Peter from the 1980s to the present. Reineke Hameleers, Director, Eurogroup for Animals and me with the EU Parliament in the background. Another presentation of note was as the keynote speaker at Eurogroup for Animals AGM in Brussels. Eurogroup’s mission is to ‘build a Europe that cares for animals’ and is a ‘confederation of 46 like minded organisations that can mobilise millions of citizens to defend the welfare of animals and act to ensure European, national and local decision makers take note and respond to our concerns.’ I wholeheartedly support its mission. 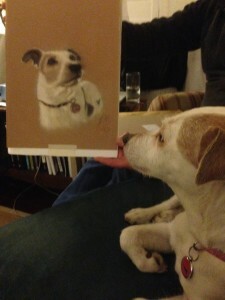 Shelly admires her portrait by my cousin Joan Heather. Finally, on a personal note, my partner, Gary, and I said goodbye to Shelly, our beloved dog. She lives forever in our hearts. I wrote about her frequently in my social media and published many photographs of her mostly stretched out on cushions or walking around Hastings Old Town where we live or of her many adventures with us. I joked about how she had an international fan club but I never realised that she did in fact have one. Some 200 friends and associates on Facebook movingly commented on Shelly when I wrote about her passing. It’s very touching to know that Shelly touched the lives of many people. 2016 is already turning out to be another busy year of advocacy for animals. I don’t have any special plans to celebrate or recognise my fortieth anniversary in vegan, animal rights campaigning. I’m quite content with knowing that there isn’t any other way that I would live my life.